Sectional Overhead Doors are one of the highest performance doors available for their sealing, insulation and general security properties. 10 different models from Samson Doors with sizes up to 10000mm wide and 7000mm high and more window options than usually ever required, as well as every RAL colour option available, the sectional door offers one of the very best solutions for most door openings and is very competitive in pricing against almost every other option. A sectional door will provide many more years of trouble free operation than nearly every other type of industrial door as the stress on scomponents is so evenly spread and the mechanism ensure the door balances to make easy operation possible. With regulations regarding building insulation and air tightness the sectional door fits the bill with some models capable of delivering a U-value of up to 0.51 W/(m²·K). Wicket door options with trip free thresholds only 10mm deep!! Scratch Resistant Glazing with Duratec synthetic glazing for windows. 80mm Thick Panels for extra insulation properties where required in cool warehouses. Lifting Track Angles from 90 degrees through to vertical lifting to maximise roof space inside. 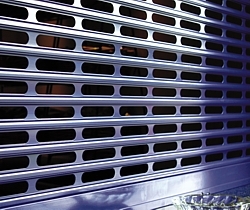 Grille Mesh Design Panels for ventilation in car parks and other applications. Sectional overhead doors open vertically upwards, creating clear space in front of and behind the door. Inside the building too, useful space is not wasted because the door sections can be parked underneath the ceiling, parallel to the ceiling or vertically on the wall depending on the tracking configuration specified. Since the doors are fitted behind the opening, the clear passage width can be used in full. This virtually excludes any risk of damage. 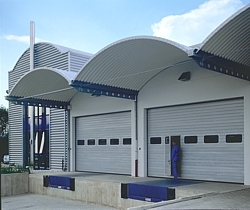 Sectional doors are generally available as single skin galvanized steel panels right through to double skinned foam filled insulated panels of up to 80mm thick. With the Samson SPU F42 doors the double-skinned sections are 42 mm thick throughout and this is our biggest selling sectional door model, and most cost effective too. The strong insulating core of 100 % CFC-free polyurethane rigid foam produces an exceptionally good insulating value. The structure of the SPU F42 door sections is built up to guarantee utmost stability and robustness. The thick insulating core of high-grade polyurethane rigid foam is applied evenly in a continuous computer-controlled process. The result: a material composite that will guarantee a long service life. Sectional doors can be produced up to 10 metres wide and 7 metres high in the SPU 67 model but most other models will go up to 8 metres wide and 7 metres high so there is usually a sectional door available for the opening created and excellent wind ratings too. If maximum use of daylight, good thermal insulation and a high level of stability are called for, the Hormann TAP 40 door can meet these requirements threefold: On account of the cold-repelling 16 mm thick double glazing, the aluminium extrusions with thermal breaks and the double-skinned PU foam-insulated steel bottom section (100 % CFC-free). This combination produces a remarkable thermal insulation value. The aluminium extrusion has an overall thickness of 42 mm in a TAP 40 door. The outer and inner shells incorporate thermal breaks with glass fibre reinforced polyamide ribs and are at the same time positively bonded. This ensures a high degree of stability and protects the structural fabric. 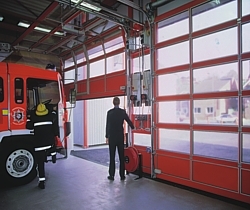 To ensure that the main sectional door does not always have to be opened to allow personnel traffic to pass through, wicket pass doors present a very practical solution. The Hörmann wicket door without trip-free threshold prevents tripping and makes it easier to drive over. This is a far better solutio than the very clumsy roller shutter door personnel door option. Power-operated doors feature a VL 2 leading photocell with two sensors which causes the door to reverse on encountering an obstruction well before contact is made. The wicket door contact ensures that the main door can only be opened when the wicket door is closed. In certain circumstances Hörmann wicket doors with a trip-free threshold up to a width of 5500 mm fulfil the requirements of an emergency escape door. The vertical opening of the sectional industrial doors creates space in front of and behind the door allowing you to park vehicles closer and utilise the room inside a building. A safe and reliable door option. 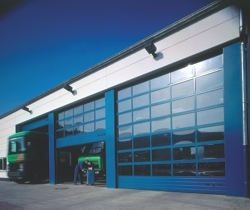 Samson Doors can provide high quality commercial sectional garage doors for various commercial premises purpose-built to meet your exacting needs. Fully glazed doors are ideal for showrooms. Vertical operation for optimum use of internal and external space and excellent security and insulation means you already have a door that exceeds anything most other garage door types can offer.